Cal Clutterbuck scored the tiebreaking goal with 1:28 remaining in the third period and the New York Islanders defeated the New York Rangers 6-4 on Sunday. Johnny Boychuk had two goals. Kyle Okposo had a goal and assist and Brock Nelson also scored for the Islanders and defenseman Nick Leddy had two assists. Frans Nielsen added an empty-netter with 1:01 remaining. The Islanders, who led 3-0 and 4-2 before the Rangers rallied to tie it on Derick Brassard's goal with about 8 1/2 minutes to go, ended their season-high seven-game road trip at 6-1-0. Eric Staal had a goal and an assist for his first points with the Rangers in his fourth game since being acquired in a trade from Carolina just before the deadline. Oscar Lindberg and Tanner Glass also scored for the Rangers. It was the first meeting of the season between the rivals at Madison Square Garden and also a possible first-round playoff matchup next month. The Rangers are second in the Metropolitan Division with 82 points and the Islanders are third with 79. 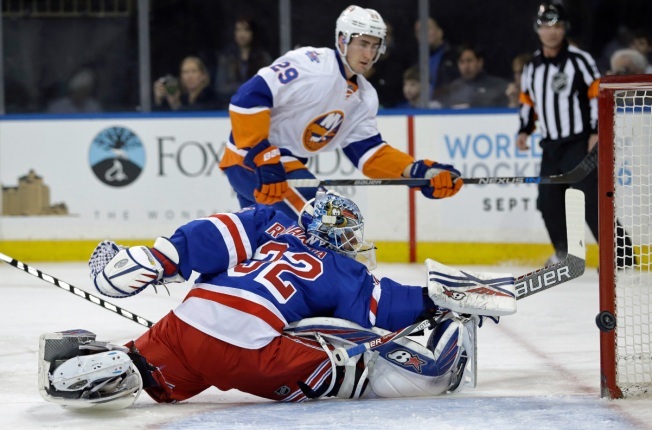 The Rangers have lost six of their past seven home games against the Islanders, going back to Feb. 14, 2013.